Treat dry, damaged hair to the Sukin Hydrating Shampoo; a cleansing and nourishing formula with a Coconut and Lime fragrance to invigorate the senses. Fortified with Shea Butter, Olive Oil and Coconut Extract, the lightweight shampoo refreshes and revitalises hair to leave strands soft and frizz-free from root to tip. Locks feel repaired and strengthened after use. 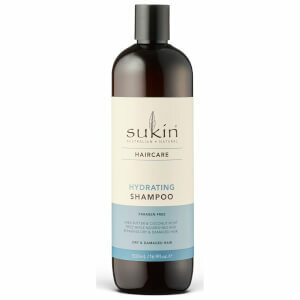 Wet hair and massage shampoo into the scalp to form a gentle lather. Rinse thoroughly. Water (Aqua), Aloe Barbadensis Leaf Juice, Cocamidopropyl Betaine, Sodium Lauroyl Methyl Isethionate, Cocos Nucifera (Coconut) Fruit Extract, Butyrospermum Parkii (Shea) Butter, Olea Europaea (Olive) Fruit Oil, Tocopherol (Vitamin E), Glycerin, Polyquaternium-10, Sodium Chloride, Fragrance (Parfum)*, Tetrasodium Glutamate Diacetate, Citric Acid, Phenoxyethanol, Benzyl Alcohol, Limonene**, Citral**. *Natural Fragrance **Component of Natural Fragrance.